Walk the trails and roads of the Brickyard Creek boreal forest for 15 years and you’ll begin to notice a few things. First and foremost, the forest is dynamic and ever changing. Give the forest half a chance and the recovery of the 10,000-year-old boreal forest odyssey will appear gradually over the cycle of seasons, right before your eyes. Give yourself a chance to witness this recovery and you’ll have the good fortune to be a part of the restoration, attuning your senses to the year-to-year, almost imperceptible reawakening on the ground. If you risk embracing a sense of belonging, the forest will bring you into its intimacy, unveiling secrets gathered over millennia and held in the forest’s soul and DNA. After fifteen Augusts, a walk through the woods or along the path may unearth a host of revelations. Walk and watch and you’ll see that the boreal forest is persevering and resilient. 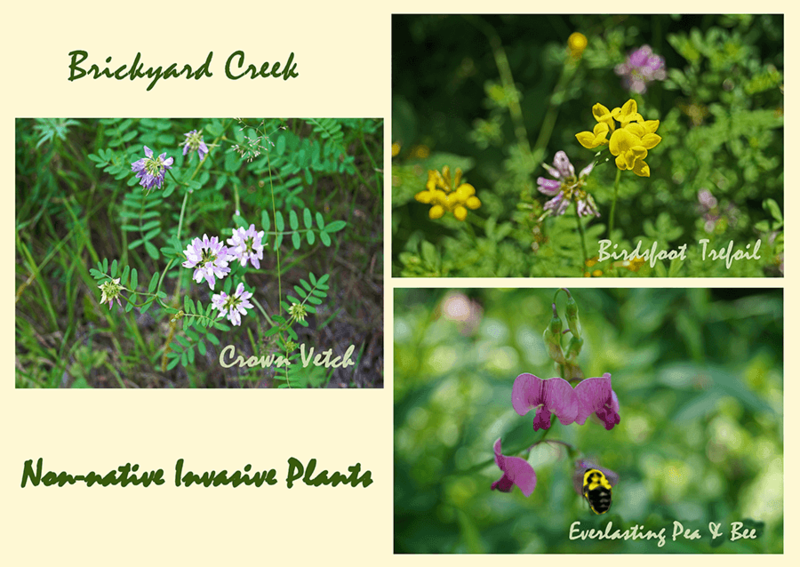 As a native plant community, the BYC forest has chosen member species willing to embark on a long-standing cooperative effort to eke out a living in an often rugged and challenging ecosystem. Each surely has had to vie for its survival in order to adapt collectively to a climate with cold, snowy winters, short summer growing seasons and the moist, moderating and shifting conditions upon the red clay shores of Lake Superior. 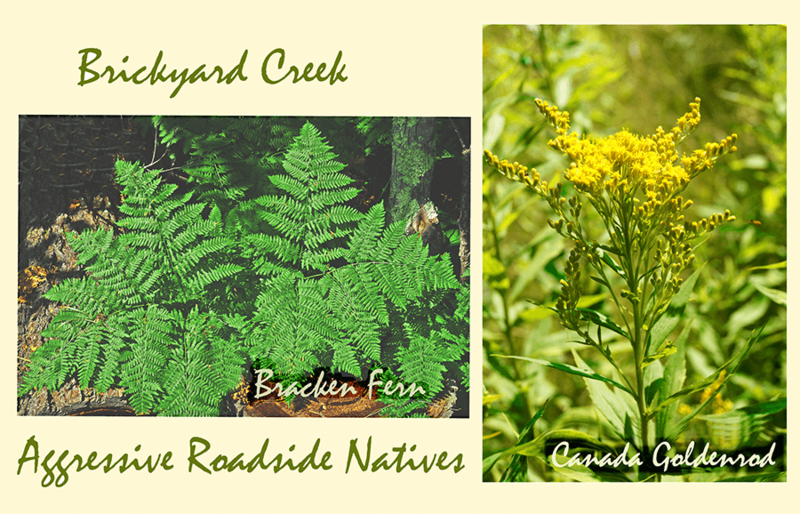 New arrival, non-native invasive plants from far-off continents have found their way into this forest, perhaps on the wind from nearby farmland or as hitchhikers on the wheels and fenders of visiting automobiles. They line the edges of BYC roads and home sites that have opened the forest to the mix of light and stray seed. Still, the Brickyard Creek boreal forest can be seen everywhere fending for itself in response to the invasions of foreign plants that have found refuge along the newly created, man-made forest edges. One can see this multi-species, cooperative effort energizing the forest underneath the dominant trees. A forest by nature is a shady place as it filters and apportions light to benefit all its members beneath the cover of trees. Here below the evergreen needles and broad leaf trees, the boreal forest displays its own pattern of light and shade. The trees are the keepers of the sun’s light for everything in the forest. Take a tree that has fallen in the wind near Sophie Lane. The forest will now sense a new opportunity to renew itself in the light created on the ground below. Soon enough there will be a response by the surrounding canopy to cover the sunlit opening. The forest must protect its motif of shadiness and sunlight as a part of its 10,000-year design and venture. Young trees, patiently waiting their turn beneath the parent trees, now perk up to the light let in by the fallen elder to harness a chance at finally becoming adult members of the forest. 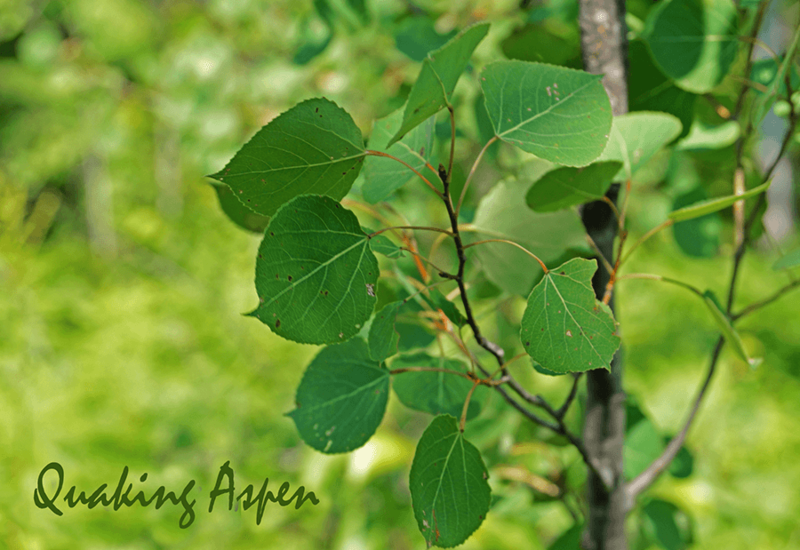 The ever-present quaking aspens and white birch are eyeing the new opening to move in as fast growing, sun-loving pioneers. The opening will not last for long and soon the shade will be made whole once more, as the forest mends and routinely renews itself. On the forest floor, the play of light and shade is kept in a balance suited to the needs of its native member plants. The passage of 15 years has allowed a 10,000 year-old community to come alive. To a Brickyardian hiking the woods from year to year, these old long-established members of the boreal forest are gaining in strength and numbers. Native wood, oak, lady and ostrich ferns find niches in mixes of light and moisture. Multitudes of moss species cover their favorite surfaces of wood, stone and soil, preferring the shade and shying away from the direct sunlight. Blue beaded lilies bearing berries and fine-stemmed starflowers cluster in patches where the sun finds a small daily window of time through the forest canopy above. The Canada mayflower carpets the grounds through hidden rhizomes appearing from under the dried leaves of last year’s harvest. They are topped in turn by a collection of soft white blooms in summer and red berries in fall. Big leaf aster and wild strawberry, which fancy a wider range of light, can keep time with the outlaw invasive, non-native species at the forest’s edge. Each year, the native plants’ presence have become more abundant, filling the nooks and crannies of the forest floor. Sun-hungry invasive plants lining the roads and home sites have enjoyed a long tenure at the gravel’s edge during the last 15 years. Crown vetch was among the first, climbing over and covering anything growing in its path. The yellow flowers of birdsfoot trefoil color the roadside, taking advantage of shade-adapted natives not accustomed to the sunny exposure. In the broad openings, the everlasting pea will spread with abandon, easily finding a place for itself in the sun. Still, over 15 years, the forest is slowly reclaiming many of these outlaw hangouts with a few of its own more versatile boreal natives, and with the help of some aggressive outlying woodland edge plants. Walk along Sophie Lane where the forest has made a stand and you will find large beds of big leaf aster skirting the bottom of trees and replacing the renegade European grasses. Wild strawberry vines infiltrate the tight spaces among the invaders. A sensitive or wood fern crops up here and there to extend the forest boundaries. The bracken fern makes quick business at advancing one of its own in the forest’s restoration. 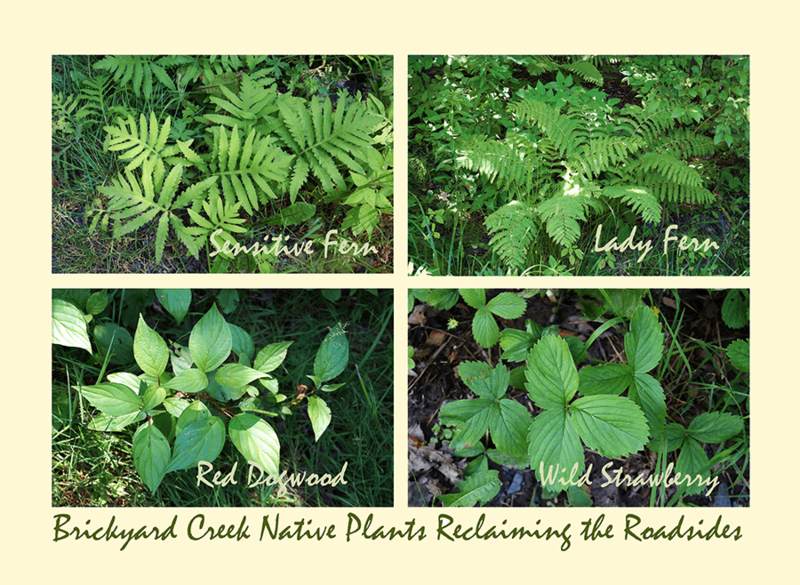 Native ferns, wild strawberry, Canada mayflower and small dogwood trees fend for the forest, recapturing the gravel of parking areas and road surfaces. Joining forces along the roadsides are some very aggressive native woodland edge plants. Canada goldenrod is thick, resourceful and formidable. Still, it is a native and highly prolific competitor with non-natives and casts a rugged, yellow character to autumn along the woods. The now, ever-present bracken fern brings a magical woodsy flair along roadsides, which are yielding back some native ground. Thimbleberry rises high among the contenders, trading its white blossoms for red raspberry-like fruit in late summer. Walking Sophie Lane and the other roads of Brickyard Creek for 15 years, it has been heartening and reassuring to see the boreal forest holding its own and being so resilient at restoring itself within the course of human endeavors. Perhaps it is good to know that the forest can have the upper hand. In this instance, it is wonderful to be included in ancient native relationships formed so exclusively over time, making up the special character of this boreal forest. But best of all, it is the sense of belonging to the restoration, which requires participation and humility, that will foster the greatest fulfillment as a citizen of the boreal forest.